This Paneer and Jeera Pulao, I tasted in my friends house. 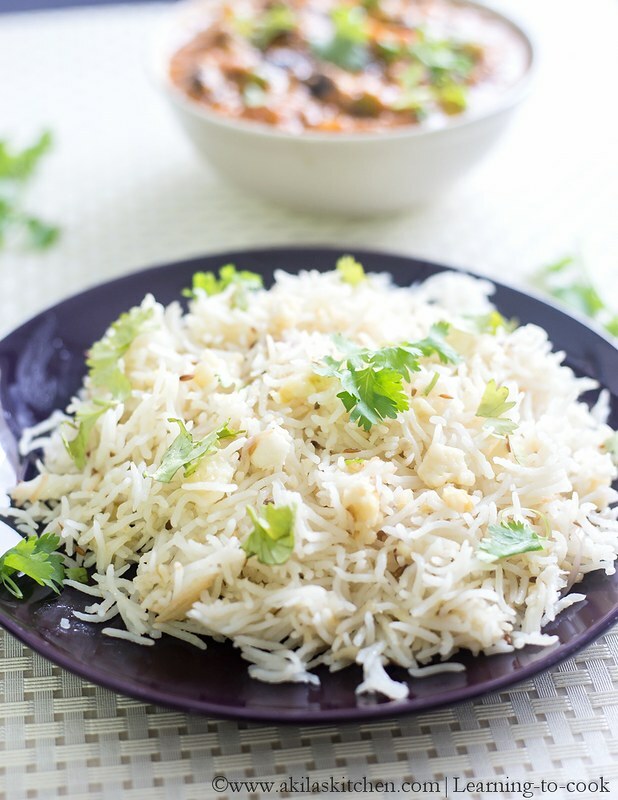 In this recipe, she used the crumbled paneer and it tastes great when combined with the smell of jeera (cumin seeds). So I tried the same at home last Saturday and prepared the mushroom matar curry as the side dish to go with it and the crispy mushroom pakora as snack. Everything goes very well together. 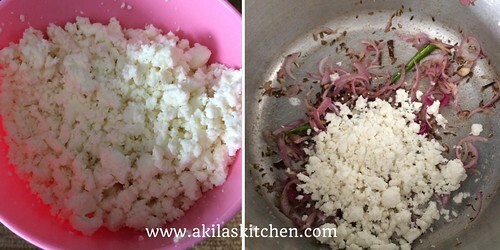 So let’s see the preparation of easy crumbled paneer and jeera pulao recipe. You can check some of the tasty pulao recipes in the blog here.. Below given some links..
1. 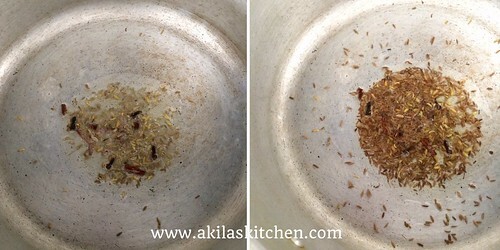 Start soaking the basmati rice now or soak it for 20minutes and filter the water and keep ready. Now in the cooker, add oil. When hot, add the ingredients mentioned in To Temper. Also add the cumin seeds. 2. 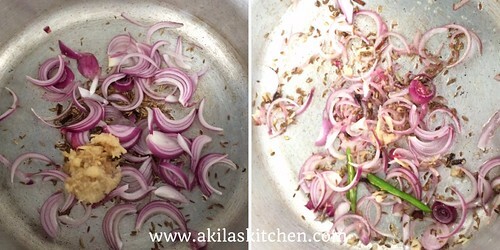 When the seeds splutter, add the onions, ginger garlic paste and sauté till the raw smell of ginger goes off. Then add the green chillies. 3. Meanwhile crumble the paneer and add to the pan. 4. 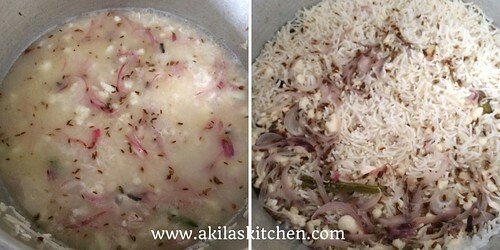 Now add the soaked rice and the 1tbsp ghee and fry for a while. ( around 2 minutes in medium flame). 5. Now add the water and when it starts boiling, check for the seasoning and close the lid and cool at low flame for 10 minutes exactly. Switch off the switch off the stove. 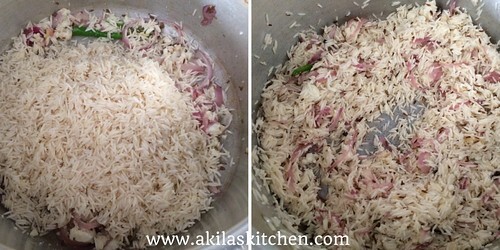 After a while open the lid and add the remaining ghee and slightly mix the pulao without breaking the rice. 6. 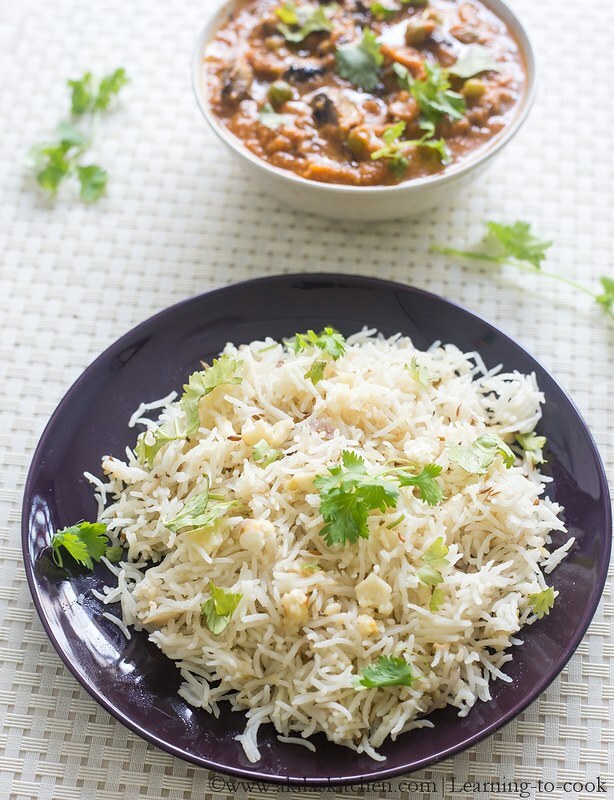 Close the lid again for another 5 min and then serve the Paneer and Jeera Pulao with the yummy Mushroom Matar Curry. 1. Here i didn’t add bay leaf, as I don’t have that time. So don’t get confused seeing the Ingredients and the picture. 2. Since we need the rice to be our white color, I haven’t added the coriander and mint leaves. If you want you can add after sauting the onions. 3. My daughter crumbled the paneer very nicely, so it’s hard to see in the picture. Try to crumble it slightly. 4. Cooking time depends on the pressure cooker. So check your pressure pan or pressure cooker instructions accordingly. Mine always takes 10 minutes, in low flame. 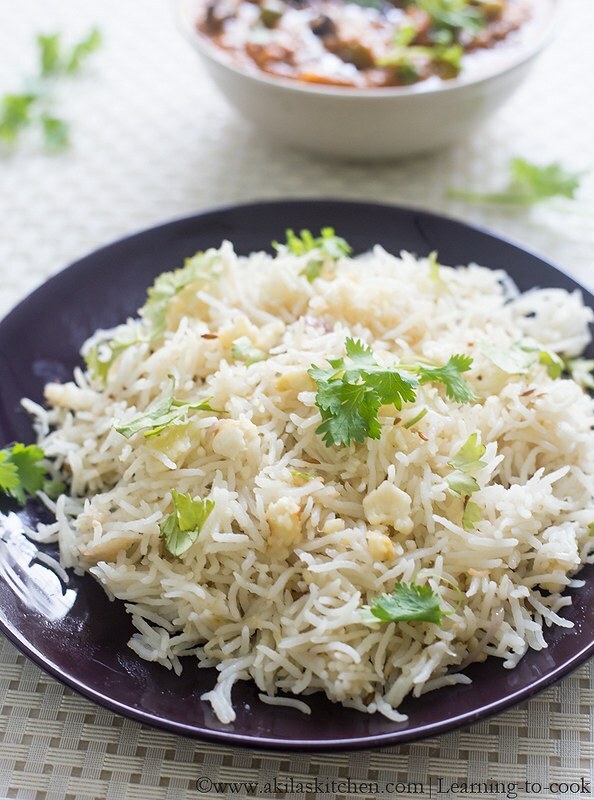 Looks simple yet very tasty rice..